I have tried many Wear OS watches, some have been good, some have been bad. But the TicWatch Pro seems to be the best watch that I have used in a long time. Its ability to maintain a great battery of 5 – 30 days, is the thing that keeps drawing me back. 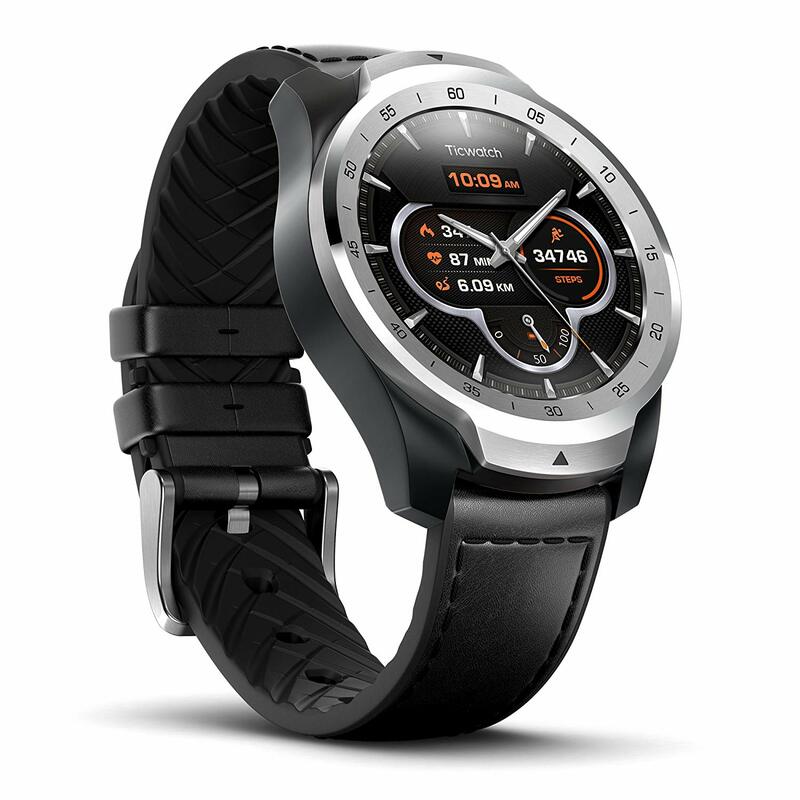 The TicWatch Pro comes in an all-black version and a silver version. The silver version has a “normal” watch look to it, with the silver face and clip. While the black version is all black and I think this looks the better of the two. The 22mm strap has a leather look on the top and a silicone material on the underside. This means that even getting sweaty won’t feel uncomfortable. Out of the box this looked like a big watch to me, but after a couple of hours, my arm and the Ticwatch Pro had created a bond. The back of the watch features a heart rate sensor in the centre and contacts for the included charger. This is where you will find the speaker too. There are two buttons on the side of the watch. 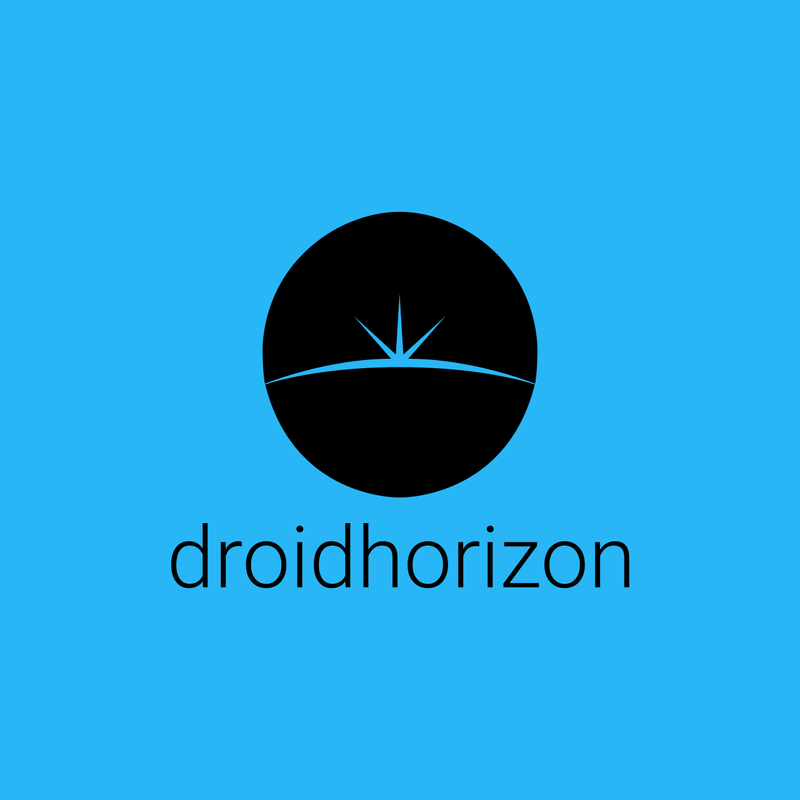 The button closest to the top is power, Google assistant, and app list button. The bottom button is customizable, so you can link it to an app via a single or double tap. This was good to see, as I was able to set it to Google Payments. Between the buttons is the mic. 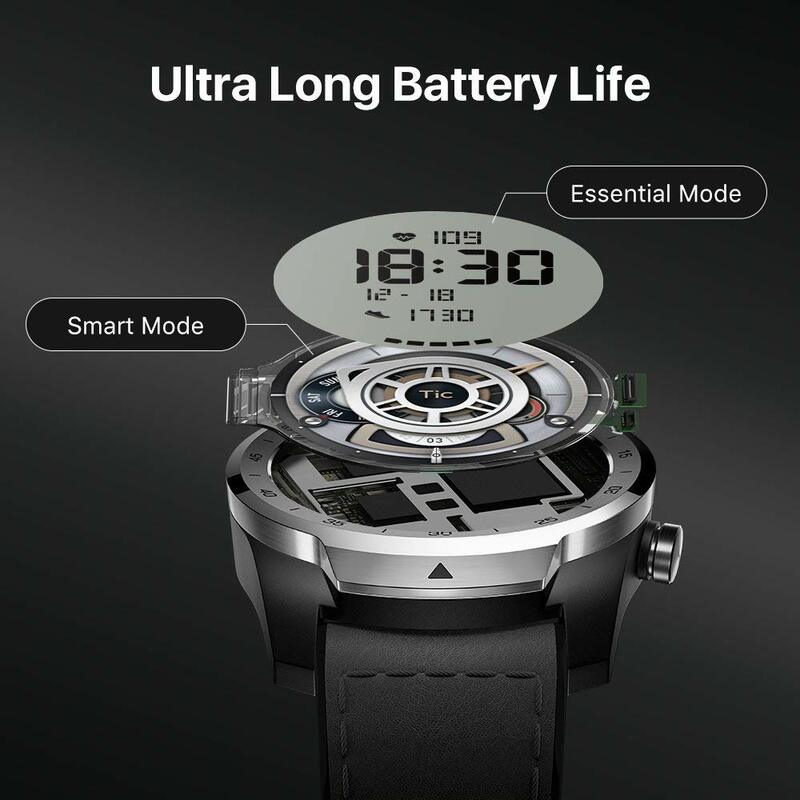 The TicWatch Pro’s claim to fame is its use of a dual-layer AMOLED/FSTN display. 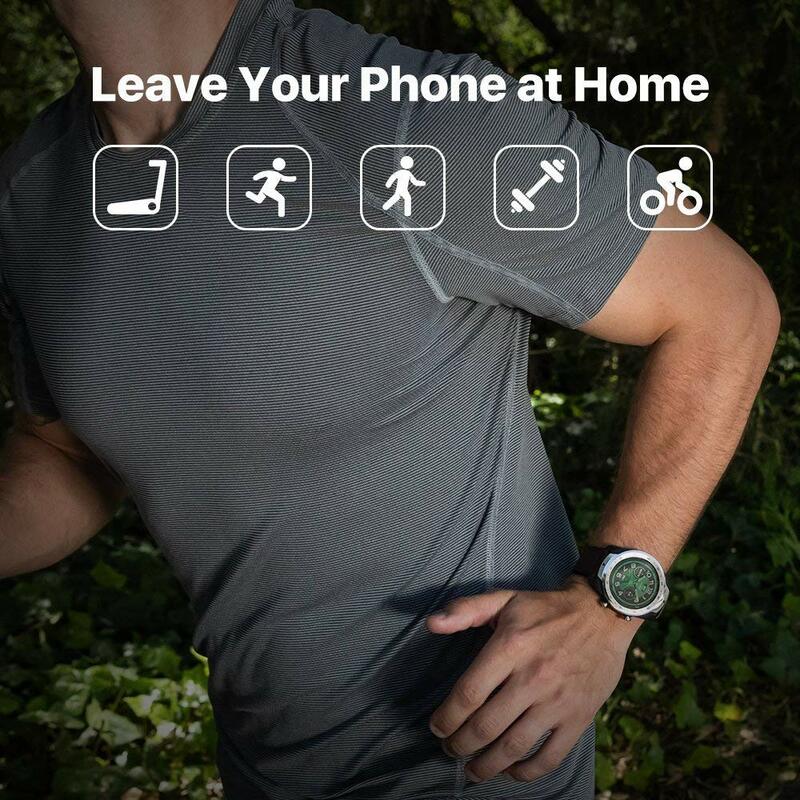 What this does is allows the watch to flick to an “essential” mode which uses the FSTN screen, allowing you to see time, date and steps while conserving battery life. When in normal use I have managed to get around 3 days before I need to charge. You can also set it to Essential mode permanently, allowing you to get around 30 days. SO you lose the Wear OS function, but that’s not a bad thing when at work, or out and about. Charging the TicWatch Pro is done using the included magnetic charger. To fully charge takes around 2 hours. You can also buy spare chargers for around £17 which isn’t to bad to have one at work. Smart mode is the recommended setting, as this will activate the essential face when you stop using the watch, and you can go back to Wear OS with a flick of the wrist or a touch of the button. The Wear OS interface works perfectly, it feels fast and you can always drop the animations to get a snappier response. Notifications can do a short, long or double vibrate and these always get my attention. 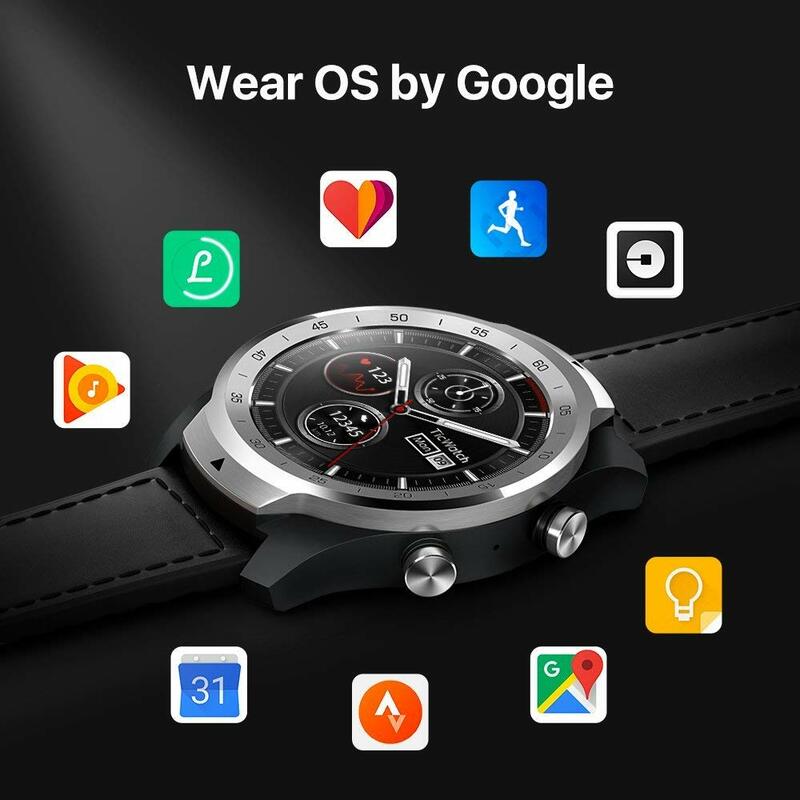 Everything else is pretty standard Wear OS stuff, swipping up will get settings, right to get assistant, left to get steps and down to get notifications. Replying to messages to easy enough via the watch face, but you couldn’t write Shakspere on it. Calls on the watch are ok, in a quiet room, or away from traffic, both parties had no problems hearing each other. If you are after a Wear OS watch, this is a really good choice and is my daily driver now.